Ok, y’all, yesterday was my 100th post (not in total for the year), and nobody visited my site! It’s the first time in months that my blog didn’t receive a single hit and I feel… Forlorn? Eh, it happens. So let me see if I can post enough key words in this awesome blossom Mighty Mini post to get some hits, shaaaaaaaaaaaaall we? Tonight, I’m off to the orchestra! Hence the earliness of this post. It also is what I was rambling about yesterday that seemed to go over so well. I mean, seriously, who knew that Beethoven was no longer the cat’s meow? So, early reports for the movie Date Night is that it’s a terrible script, but works really well on the drive of the two awesome leads (Steve Carrell and Tina Fey). I was worried it would be terrible, but it looks like it may be worth a gander. If anyone checks it out, lemme know if it’ll be worth the cost of admission. Please explain Justin Beiber. I feel like, if there is only one thing I have learned from the new Twitter homepage, it’s that apparently, this kid is all anyone ever tweets about. And apparently the Jonas Brothers fans hate the Justin Beiber fans? Calm down, girls, they’re both obnoxious. Heidi and Tim, awesome overload. So who’s been watching this season? Don’t lie. Yea, it’s crazy.So, Major Spoilers for last night’s episode of Project Runway, but the announced who was going to Bryant Park. Sadly, adorable Anthony didn’t make it, but expect great things. Mila and Jay are “tied” and will have to make a collection, but then compete to actually get to the final show. Mila will most undoubtedly color block everything. Emilio and Seth Aaron are guaranteed in for the finale. It should be a great show! As a subpoint, Nobody tell me what happened on Shear Genius! I’ve DVRed the episode, but haven’t had time to watch. Hopefully Brie did not win, considering she’s a hang with Orange Fanta colored hair. Chuck. I know, I know, I talk about this show all the time. But it’s “on the bubble” so to speak and it needs to be saved. Chuck has made it to E!’s Save One Show final round and the show needs your votes. 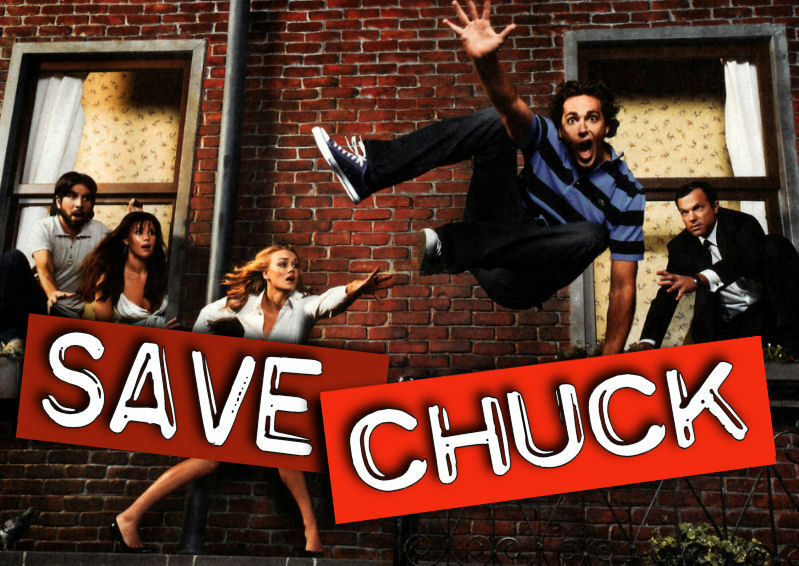 Please go and vote for Chuck to save it for another season. Click here to support one of the best shows on TV. Let’s see, more things to get hits to my blog, ah, yes: SPOILERS, LOST, FINALE, SHOW, TV, 24, AMERICA’S NEXT TOP MODEL, ETC. ETC. ETC. Speaking of “All Tyra, All the Time,” I thought about auditioning for America’s Next Top Model when they were in Raleigh. But then I realized that I could never live with such an insane group of people. I’m not even kidding, I’d probably have a panic attack. Check out Hash Tag films. You can submit your films, photography, etc. For North Carolina folks! Click here to visit the local wonders! I think that’s a pretty hefty Mighty Mini post, don’t y’all? In other news. This gif may have changed my life. Enjoy, other Family Matters/Carl Winslow fans. Date Night is just the kind of movie you’ll dig (as I recall, you also liked “The Proposal.” This one is a bit better). I don’t know what a Justin Bieber is, but I wish it would hit puberty. And “Chuck”? I think they’re going for broke this season, so if it is picked up, they won’t have anything left to do with it next year. (I’ll still root quietly).